Enjoy the best sightseeing experience and see all the sights of magnificent Dubai and the UAE Capitol City Abu Dhabi on any chosen day with the special ‘Big Bus Twin-City ticket’. 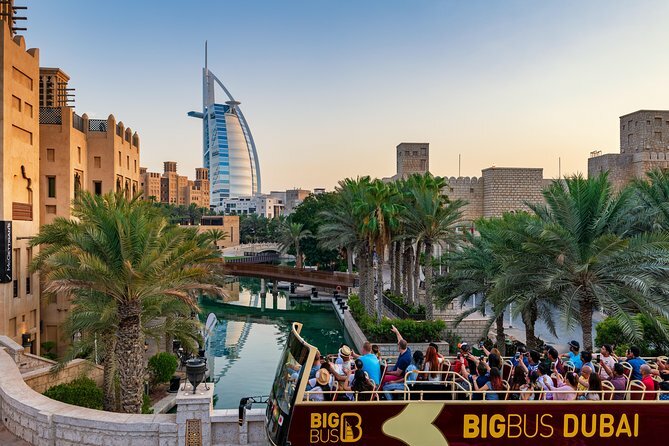 Hop-on and hop-off at any of the stops and explore the places of interest at your own leisure.DUBAIHop on our Dubai bus tour to experience a true fusion of traditional Arabian charm and futuristic dynamism. Enjoy panoramic views of Dubai’s dramatic skyline, perfect sandy beaches and the world’s tallest building, Hop off to explore historical souks, forts and palaces and enjoy the ultra-chic dining and ambient nightlife. ABU DHABIAbu Dhabi is the capital of the UAE where Arabic charm blends into futuristic fantasy. Hop on our 1 Day tour to discover rich tradition at the Grand Mosque and Heritage Village and modern majesty at the Louvre. Explore the man-made Yas Island on the ‘Yas Island Drive’. Enjoy sightseeing, shopping, museums, markets, souks, local dining or the beach, as this tour allows you to experience the best of Dubai at your own leisure. The open-top double-decker bus provides fantastic views and a great atmosphere to explore. From the towering Burj Khalifa and the 7 star Burj Al Arab to the mysterious gold and spice souks, this fully narrated audio tour allows you to hop-on or hop-off at over 26 locations throughout the city. The tour ticket is valid for the entire day and frequency of the buses is every 30 minutes. Air conditioning is available on the lower deck and recorded commentary is available in 12 languages including English, German, Spanish, Brazilian Portuguese, French, Italian, Chinese, Japanese, Arabic, Russian, Hindi, and Farsi. Abu Dhabi is the capital of the UAE where Arabic charm blends into futuristic fantasy. Hop on our 1 Day Hop-on Hop-off tour to discover rich tradition at the Grand Mosque and Heritage Village and modern majesty at the Louvre. Explore the man-made Yas Island on the ‘Yas Island Drive’, which includes stops at the Yas F1 Marina Circuit, home of the Abu Dhabi Grand Prix, and world-class attractions such as Ferrari World and Yas Waterworld parks. Air conditioning is available on the lower deck and recorded commentary is available in 8 languages including English, German, Spanish, French, Italian, Chinese, Arabic and Russian. Departure Time: Your booking voucher should be redeemed and first used in Dubai. Visit both Emirates on any chosen day with the special ‘Big Bus Twin-City ticket’. Hop-on and hop-off at any of the stops on the city tours in Dubai and Abu Dhabi. The ticket includes a FREE intercity shuttle (Dubai - Abu Dhabi - Dubai) departing from Mall of the Emirates in Dubai to Sheikh Zayed Grand Mosque in Abu Dhabi, where guests can hop on the Abu Dhabi tour. The return shuttle departs from Marina Mall Abu Dhabi at 6pm, returning to Mall of the Emirates at 8pm / 8:30 pm (subject to traffic). Pre-booking is necessary for the intercity Dubai - Abu Dhabi return shuttle, available every day except Fridays. Start with a traditional abra boat ride across busy Dubai Creek, for a walking tour around some of the city’s beguiling markets. See where merchants have traded for centuries, breathe in the aroma of the fragrant Spice Souk, and hear tips for successful haggling at the world-famous Gold Souk. Your exciting 1-hour tour also visits Khan Murjan Souk, an underground market with magnificent 14th-century Arabian architecture. See the sights of Dubai Creek from a traditional dhow boat while learning about the history of the famous stretch of water. See where the city’s sea merchants have traded for centuries and marvel at the traditional and modern buildings that comprise the international face of Dubai that you see today. Sail to the mouth of the creek to admire stunning views of the Arabian Gulf before returning to the quay where you can reboard your hop-on-hop-off bus, if you wish. Complementary refreshments are available on board. Use your Welcome Card at Wafi shopping mall in Dubai to enjoy savings of up to 20 percent on purchases at select outlets.